There are seven classical dance forms in India: Kathak, Odissi, Manipuri, Bharata Natyam, Kuchipudi, Kathakali and Mohini Attam. Theatre and dance art forms in the oral tradition of India are centuries old and follow the rules of the Natya Sastra, of which the written form came much later. Kathak is the classical dance form that prevails in the North of India. 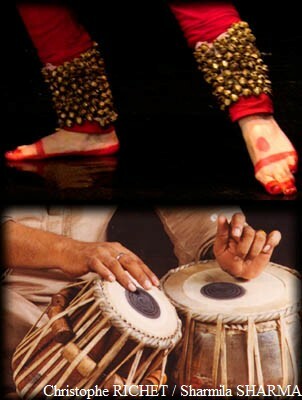 The word Kathak is derived from katha meaning "storytelling". The expression Katha kahe so Kathak means whoever tells a story in a dance form with song is a Kathak. The movements of hands (mudra) and body along with facial expressions (abhinaya) were used to tell a story with song and music and this gave birth to Kathak and Kathakars. Originally, the artists known as the Kathakars told mythological stories (harikatha) in the Hindu temples of Northern India and obviously their art was deeply rooted in the Hindu religion, philosophy and spirituality. The Kathakars' knowledge - compositions and choreography - were passed on from generation to generation through oral tradition. Between the 12th and the 18th century, Kathak was practised in the magnificent palaces of the Mughal emperors and even earlier in those of Hindu rulers. After being a totally devotional temple art, it had also become a court dance, intended to entertain those powerful rulers. It enriched itself by borrowing from Persian cultural elements and as such, the aesthetics of the dance evolved in accordance with the aesthetics of the Muslim culture too. Nowadays, Kathak is the only Indian classical dance form that presents a strong symbiosis of the Hindu and Muslim cultures.